Is the Federal Reserve, as President Donald Trump suggests, crazy? A look at the changes to both its policy and its forecasts over the past two years shows very modest moves in response to new economic realities of stronger growth and lower unemployment — outcomes for which the president has taken full credit (and deserves at least some of it). Back in September 2016, the median forecast of Fed officials pegged core inflation (taking out food and energy) at 1.9 percent for this year. That's exactly what was printed in the second quarter. Here's what's changed: real gross domestic product was forecast to run at 2 percent but has averaged 3.2 percent so far this year, or a full percentage point higher than forecast. Unemployment, at 3.7 percent, is 0.7 percent lower than the Fed had forecast back then. In response, the Fed looks likely to add just one quarter point extra rate hike than it planned two years ago, assuming it hikes in December. 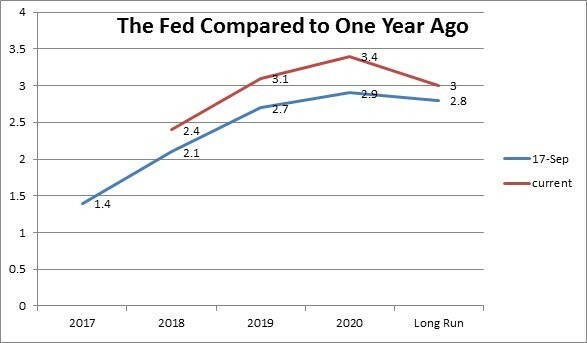 So, the fed funds rate will be 2.4 percent, compared to the forecast of two years ago of 2.1 percent. 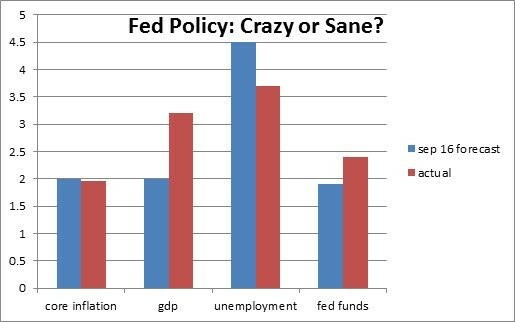 Another test of crazy: has the Fed dramatically altered its forecast for rates? One year ago, the median forecast for Fed officials saw a 2.7 percent funds rate in 2019, and it's now 3.1 percent. So the Fed added an additional 0.4 percent in rate hikes over two years. (Remember, 30 basis points of that came from 2018.) The net add for 2019 was 10 basis points, but that came with the Fed forecasting higher growth and an unemployment rate well below the median estimate for the natural rate of unemployment. To be sure, added all up, the real change accumulates to make 2020 look a bit scary: the median funds rate is 3.4 percent, compared to a 2.9 percent forecast for that year in 2017. But that's just another 10 basis points on top of what was added for the prior two years. The hawkish part is that it shows the Fed 0.4 percent above its long-run or neutral rate of 3 percent. That is, the median Fed official forecasts that the Fed will move into restrictive territory to slow the economy. That could be a source of angst for the markets in this sell-off, and perhaps something the president would be justified in criticizing. Except this: that change came in December, or 10 months ago. Maybe the market is reacting to it just now, but it has known that information for a very long time. More so, remember what happened in December 2017? It became clear at that point the tax cuts would pass, which is to say, the trend toward higher rates by the Fed has occurred in direct response to policies promoted by the president. It's worth recalling that many economists at the time argued there would be a price to pay in higher rates and higher inflation from those policies, specifically, a massive tax cut and deficit increase into an essentially full-employment economy. Some of the change in the Fed forecast is the result of the Fed simply reacting (sanely and cautiously?) to the better growth and lower unemployment that came with those tax cuts. Another part is the market reacting to the bigger deficits those tax cuts have generated. Add to this the president's tariffs polices, which have also created the risk of higher prices. None of this is to say the Fed's forecasts are right or that it isn't in danger of making a mistake. In fact, they have a solid track record of getting a lot of this stuff wrong, in particular predicting better growth and higher unemployment and, importantly, more inflation over the past several years than actually came to pass. But is it really crazy to add an extra 50 basis points of tightening to the forecast for the next three years in response to an outlook for stronger growth and lower unemployment and unexpected tariffs and bigger deficits?